A full classical education should provide students with the basic concepts of important subjects, but more significantly, it should provide them with the tools to continue learning, not merely to complete college-level courses, or to retrain for a new job, but to gain the wisdom and understanding that will guide them to discern and fulfill God's will for their lifetimes. Scholars Online offers courses in sequences of subject matter that allow students to gain mastery over each subject through rigorous study of fundamentals and constant application of skills, spread out over a six-year program that can begin in sixth grade, depending on the individual student's preparation. Students who can begin one or more of the sequences in grade 6 will have more time to devote to subsquent courses taken later. 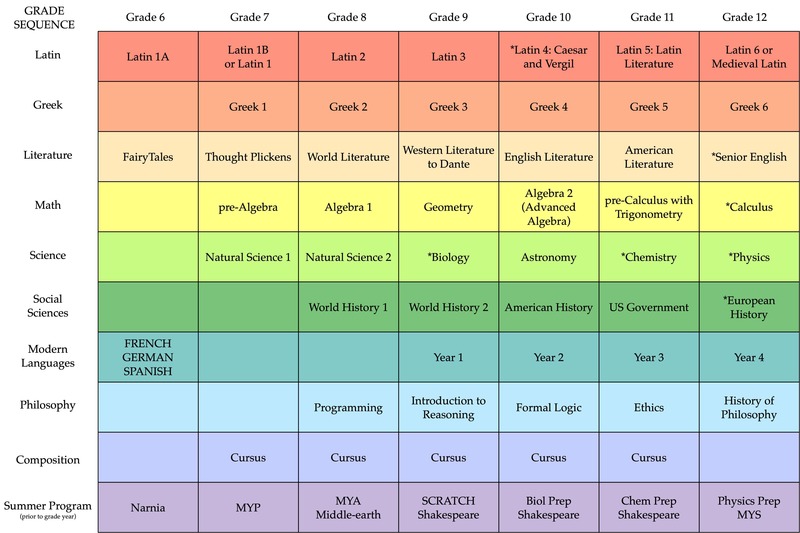 The following chart shows the curriculum plan for a student beginning as late as possible to complete each sequence. Students normally would begin more courses in the sixth grade year than shown. Courses with (*) have been designed to prepare students to take the AP examination for that subject, but which have not been certified for AP credit, since AP syllabus requirements did not meet our standards for the course. Summaries of each sequence are given on individual pages, along with the course listings for the current academic year and summer sessions. The following lists are guidelines only. Individual students may be able to accerate some areas, and others may not be able to include all sequences in their curriculum. Grade 8: Latin 2 Take National Latin Exam! Grade 9: Latin 3 Take National Latin Exam! Grade 9: Greek 3 Take National Greek Exam! Grade 10: Greek 4 Take National Greek Exam! Grade 11: Greek 5 Take National Greek Exam! Grade 12: Greek 6 Take National Greek Exam! 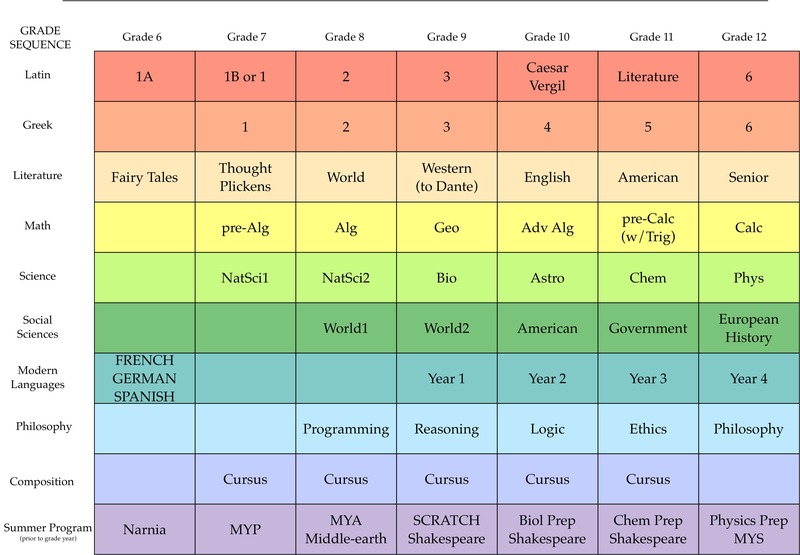 Grade 12: Senior English (extensive composition content) Take English AP Exam! Grade 10: AP Biology - Take AP Biology Exam! Grade 11: AP Chemistry - Take AP Chemistry Exam! Grade 12: AP Physics 1&2 - Take AP Physics 1 and/or 2 Exam! Grade 12: European History/Senior Project - Take AP European History Exam! Latin: Latin 2 Take National Latin Exam! Latin: Latin 3 Take National Latin Exam! Greek: Greek 3 Take National Greek Exam! Greek: Greek 4 Take National Greek Exam! Science: Biology Prep (summer)/AP Biology - Take AP Biology Exam! Greek: Greek 5 Take National Greek Exam! Science: Chemistry Prep (summer)/AP Chemistry - Take AP Chemistry Exam! Greek: Greek 6 Take National Greek Exam! Literature: Senior English (extensive composition content) Take English AP Exam! Science: Physics Pre (summer)/AP Physics 1&2 - Take AP Physics 1 and/or 2 Exam! History: European History/Senior Project - Take AP European History Exam!